I am the God-Emperor of hyperbole! We’d walked 20 minutes in to find a spot away from the madness of Utah's Pioneer Day crowds who were crossing lines and fighting over the same stretches and bends of the river. All along the path and through heavy weeds grown thick after a season of rain, there was no one around but our party. Hip-deep in the waters of the Heber, we fished our private bend in peace all morning, surrounded by mountains and trees. It was one of those outings when the few trout that were biting were spitting our hooks faster than we could set them. We’d had other trips where we’d all pulled fish out in almost ludicrous numbers and others where we’d each caught three or four. This wasn’t one of those trips. A few hours in and none of us had landed a single fish. My daughter was the first to keep one on the line. I was, as I always am, a proud dad as I watched her play out the fish. It was, by the curve of the rod and her effort, a good size. Gradually, she took the fight out of it. When she finally brought that German Brown to the net it was a good 17 inches and fat on worms delivered by the recent high water. My nephew was next to bring one in. It wasn’t big or much of a fighter, but he was glad to have finally caught a fish that day. Staring down the hour when we’d need to make that 20-minute walk back to the truck in order to hit the spa before our lunch date, I was still without a catch. It had been years since I’d gone home without having caught a single fish. We’d tried a lot of flies that morning, and I was using the one the others had caught their fish on, but nothing was happening for me. The kids were breaking down their gear and draining their boots for the long walk back, and I was dropping a few last lines in to run out the clock. I’d been all along our private river that morning and had ended up right where I’d begun, at the bend on the inside of a bubble line. I was thinking to myself, “well, the kids had fun, and that’s the main thing” when my indicator took a plunge and then shot back up. I pulled my rod skyward, but there wasn’t any tension on the line. The fly had been taken and spit out quickly. The fish had figured out that what it had bitten wasn’t a bug. I knew where the fish was, but could I catch it before we had to head back? I whipped my line back and forth and then drifted it over the same spot. My indicator shot down and right back up again before I could pull up on my rod and set the hook. I prepared another drift. At the exact same spot inside the bubble line, my indicator went down for the third time. I pulled my rod up toward the sky. This time I felt the fish on the other end of the line, heading toward the opposite bank. I stripped line to give it a run and then pulled it back in. I had a fighter on, and if I wasn’t careful the line was going to break, and that fish and my rig would be gone. I held it until my rod bent too far and then stripped out more line, letting it run and then brought it back in, swinging my rod toward the net, thinking I’d tired the fish out. It took to the air. The Brown Trout glistened in the sun as it shot whole, twisting and turning, from the river. “It’s going to spit,” I feared. Down again and downstream, I could still feel its tension on the line. A little more line out. A little more line in. Swing the rod toward the net. More line in. Keep the indicator out of the water. More line in. The female German Brown was a good size, but my daughter took the prize for the biggest catch of the day. Wading out of the river, I joined her and my nephew and prepared to walk back, our boots heavy with the waters of the Heber, to the waiting truck. The kids had fun, as had I, and I didn’t have to talk about the one that got away. 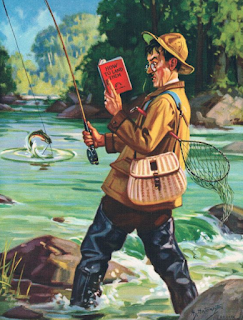 Some folks say that fishing, even in its most elegant form, fly fishing, is cruel. Others disagree. While fishing isn't my only outdoor activity with my child, birdwatching, hiking, searching tide pools, and camping are among the others, it is the only one that directly involves another life. As fun as these outings can be, hours of standing in sunshine and rushing water surrounded by nature's sweet face, each time I find myself thinking of the life on the other end of the line. I wonder if "unfeeling pea-brain" is just a line that keeps me hooked on an activity that's inhumane. Inhumane: a variant of inhuman and the opposite of humane. Let's consider that for a moment. Down the fishin' hole I go. By definition, humane, a variant of human, is "having or showing compassion or benevolence," "inflicting the minimum of pain," "intended to have a civilizing or refining effect on people." While it may be the most refined and civilized method of fishing, is fly fishing, or any fishing, humane? Is tricking another life into biting a hook, working it to the point of exhaustion and then finally killing or releasing it humane whether or not that life feels pain or will remember the incident within the hour? I have to wonder, and if it's a question is it humane to continue? I'm not hunting elephants into extinction and smiling as I hold their severed tails in the air, but if fly fishing is cruel then am I not as bad as someone who would do such a thing? If I care enough to stop fly fishing altogether and just stick to hikes and watching birds with my little one, should I not also cease eating meat altogether? After all, there is nothing humane in meat production. Meat production is business and business is the bottom line, and there is nothing humane in the bottom line. What does it say that I've considered these things for decades and yet I persist? It makes me human, not humane. Humane is a variant of human, and we speak of being humane and yet the present and history of humanity is filled with slaughter and torture and cruelty. Funny that the word conveying our best desires is derived from the word that describes we who perpetrate or allow so much suffering. We are, in our intent toward cruelty, the worst of animals. A story I'm finishing up for beta review centers on technology's increasing enablement of our cruelty to animals and how our disregard for other life perpetuates the sort of thinking that allows us to be comfortable being cruel to each other. We're better than we used to be, we tell ourselves, but I have to wonder if we're just letting ourselves off the hook. Which brings me back to fishing. Most people who fish don't do it for food. They fish for sport. It's (hu)"man versus nature" they'll tell you. So is pulling the wings from a fly, but if I caught my child doing such a thing we'd have a long talk. I never would, of course, catch her committing such an act. There's not a cruel atom in her sweet body. Fishing, to her, is just something I've approved and that we've enjoyed since she was old enough to stand in a river. Maybe it's time I had that talk with her. Maybe it's time that we all ask ourselves why we fear our part in nature so much that we must stand opposed to it. Give a Tweet. Get a Tweet. Larry McCarley is a participant in the Amazon Services LLC Associates Program, an affiliate advertising program designed to provide a means for sites to earn advertising fees by advertising and linking to Amazon.com. 2014-2017, WordStuff Publishing. Simple theme. Powered by Blogger.